Our Forest Pine (Pinus sylvestris) essential oil from Austria is a colorless to pale yellow liquid displays a fresh, soft, green, sweet, resinous bouquet. This oil is one of our favorite oils that refreshes and revives the spirits. It is mood uplifting, improves mental clarity and stimulates the adrenal glands making it perfect for your morning ritual. Direct Palm / Nasal Inhaler: Place a drop of oil in the palm of your hand, gently rub the hands together, cup your hands around your nose and take a deep breath in through the nose. You can also add several drops to nasal inhaler and breathe in throughout the day. You can repeat multiple times though out the day (for mood enhancement add bergamot and memory add rosemary). 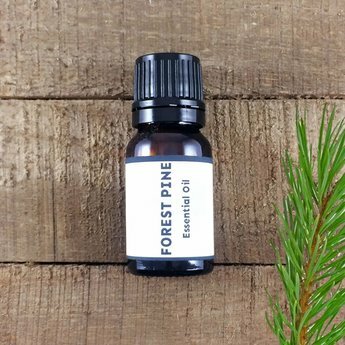 Diffuser: Forest Pine is a great addition to add to a respiratory blend (add frankincense and eucalyptus) or an antimicrobial blend to diffuse throughout house (blend with lemon and tea tree). Add to a massage oil to relive aches and pains or to move lymphatic fluid (for pain add peppermint and lymphatic add grapefruit). Add a couple of drops to a facial steam bath to help break up mucus (great with peppermint or black spruce). Bergamot, atlas cedar, cypress, eucalyptus, frankincense, juniper, lavender, lemon, rosemary, tea tree. Fun facts: Pine essential oil is said to repel mosquitoes for 60 minutes. The major uses for pine tree are wood for construction, furniture, boats, paper products, turpentine, pine oil and pine nuts for food. Cautions: Pine oil is known as a non-toxic and non-irritant. It may however irritate mucous membranes or cause allergic reactions in sensitive or allergy-prone individuals.